Need a Belmont office cleaner that won't let you down? Val's Cleaning is the right choice. 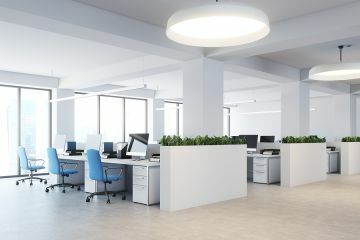 Providing superb office cleaning services in Belmont, Massachusetts for over 17 years, we can tailor a cleaning schedule that matches your needs and your budget. Call (781) 399-4009 to schedule a free walk-through of your building. We'll provide a written cleaning quote based on your specific needs. Find out how easy we are to work with! You can depend on Val's Cleaning each and every day to keep your business looking its best. Reliable office cleaning may be rare, but it doesn't have to be an oxymoron! We understand that finding and keeping a cleaning company that will show up on time and completed the work that was agreed upon consistently can be time-consuming and frustrating. Most businesses replace their office cleaning company in Belmont every 18 months. The primary reason is that the current cleaning company is not living up to expectations. You need and deserve a dependable office cleaning company to maintain your offices in a clean and inviting manner. Not one that requires constant micromanagement. Call (781) 399-4009 for consistently thorough Belmont office cleaning, week after week. The thoroughly trained office cleaning crew at Val's Cleaning has been cleaning offices just like yours for over 17 years and they'd love the opportunity to keep your office looking great too. Your cleaning requirements will depend on many factors including your number of employees, the amount of foot traffic coming through the building, your budget and your own expectations for cleanliness. Whether basic weekly office cleanings will suffice, or more comprehensive top to bottom cleaning are required for your high-end clients, Val's Cleaning is prepared and fully equipped to handle the job. Our detail-oriented, professional cleaning technicians can complete just about any cleaning project your office requires. and more – just ask! When you call Val's Cleaning for an office cleaning quote in Belmont, we'll schedule a convenient time to meet and tour your facility. We will listen to your requests and learn the scope of the work expected as well as your cleaning budget. You will then be provided with a fair cleaning quote. You will probably find that we aren't the cheapest company in Belmont, because we don't hire the cheapest employees, or cut corners on the work. Val's Cleaning's extensive hiring and training practices yield quality, competent Belmont office cleaning personnel who have a passion for doing quality work. We provide our cleaners with the best products and tools available so that they can work most efficiently, saving us time and your money. Call (781) 399-4009 today and discover the value that Val's Cleaning can offer your business. 5★★★★★ - "We have been happily using Val and her crew for the past six months. Every visit they are extremely professional and leave our office fresh and clean." 5★★★★★ - "Val and her team are the best!!!" 5★★★★★ - "I heard of Val before we bought our house because every time we visited the house prior to our closing date, I couldn't believe how clean the house was. The prior owners had two dogs but you would never know it because of the impeccable job that Val does. Prior to our move-in, we had a lot of work done which produced an obscene amount of fine dust. It was everywhere. When we moved in, my husband and I couldn't believe how clean the house was. It was amazing. What I love about Val is her take charge attitude. She knows her stuff. She knows exactly what products are needed to do the job, but at the same time she is accommodating. Because I have two young kids, using natural products is important to me. She was very accommodating to use the natural products that I wanted. She is VERY thorough with her work. She is VERY reliable. She is also extremely efficient. She's the best!" 5★★★★★ - "Val and her crew have been cleaning our house in Cambridge for 3+ years and have always done an outstanding job. She has been very dependable and attentive to any special concerns we have had. I would highly recommend her service." 5★★★★★ - "I have been using Val’s services for years. She is thorough and the house has never been cleaner. She is dependable and trustworthy and treats her house as if it was her own. Second to none, I highly recommend her." 5★★★★★ - "A friend referred me to Val 6-7 years ago, and I have used her without interruption since then. She and her team come when they say they will, they work hard and leave my home clean, well arranged, and smelling fresh. She is efficient to schedule and makes it easy to plan any special cleaning tasks I ask. Someone this good is hard to find – I have referred her to a number of friends who are as happy with her work as I am." 5★★★★★ - "Loved Val's service. I requested service for the following day for my rental apt and she obliged. She and her girls arrived earlier than expected and they went through the apt like stormtroopers. The cleaned the windows, the wood, and tile floors. The entire bathroom, everything in the kitchen including cabinets, the stove and the refrig. They cleaned the closets and the stairs going down from the apt. They left my second-floor unit immaculate. I highly recommend Val and her services. I've saved her info for the next time I need cleaning." 5★★★★★ - "Hired Val to clean a vacant apartment that needed heavy cleaning. She was professional from the first phone call and competitive in her pricing. With her crew, they made the apartment sparkle again! Every inch was cleaned thoroughly. Great job and I will be sure to use her services again." 5★★★★★ - "Val and her team helped us clean our house before we put it on the market. Val was professional, polite and reasonably priced. She and her team did a PHENOMENAL job cleaning our home. They cleaned every inch of our house and put everything neatly back into place - the house was absolutely spotless. Highly recommend." 5★★★★★ - "Val was referred to me from a friend years ago and I have been using her service ever since. I have tried several other cleaning companies in the past but just wasn’t satisfied with the way my home looked when they were done. Val and her girls do an amazing job and I love the way my home looks and smells when they are finished. I have referred Val to several friends and neighbors and as a realtor have even referred her to my buyer and seller clients." 5★★★★★ - "Val was recommended by the Realtor I used when I purchased my Condo in Wakefield 2 years ago. I am so appreciative of that recommendation. Val and her Team are A+ in my eyes and I don't know what I would do without them, the best feeling is to walk through my door on a day they have been there !" 5★★★★★ - "Val has been working in my home for 14 years. Frankly, I don't know what I would do without her! Val is highly professional, exceptionally thorough, clean, meticulous, careful, knowledgeable and timely. Her service is unmatched. Additionally, she is a lovely person – always polite, pleasant and considerate. And, she expects the same from her team. Six stars!" 5★★★★★ - "Val has been cleaning my house for years. She has also cleaned some of my apartments for rent. She does a superb job. I am a very neat person and she is the only one I would trust to do meet my expectations. She is extremely meticulous and thorough job." 5★★★★★ - "Val has been cleaning my house over 10 years, also my summer house. I had hired 3 cleaning teams before Val, and she is the best hands down. I highly recommend her." 5★★★★★ - "As the owner of a real estate company, it’s very important that I have the best people on my team. When it comes the house cleaning there is none better than Val. She is thorough, knowledgeable, and flexible. She and her team know just the right products to clean a protect every household surface. I’ve seen Val perform amazing results leaving the least kept homes spotless! If you live a busy lifestyle and want to check house cleaning off your worry list, call Val. You’ll be thrilled with her service!" 5★★★★★ - "A friend recommended Val and her crew, his family has used her for about 20 years. I only wish I had known about her 20 years ago. They are FANTASTIC!!! I absolutely love coming home after she’s been here. The smell when I walk in. Everything is in tip-top shape and sparkling clean. There isn’t a spot that they miss. They go out of the way to make me happy. And I completely trust them. I would highly recommend them and guarantee you’ll be happy!!!" 5★★★★★ - "Utmost professional, very responsive, house feels so fresh after Val & the girls have been here!" 5★★★★★ - "Val and her crew have been cleaning my condo in Winchester for the past 3 years. She is dependable, timely and thorough. If there are any areas for improvement, she takes directions well and addresses them in a timely and professional manner. I have recommended her to friends and will continue to do so!" 5★★★★★ - "Val has provided outstanding cleaning services to us for over 10 years. She is remarkably reliable and brings years of experience to her work. We recommend her highly!" 5★★★★★ - "5★★★★★ - "I’ve been using Val’s for both our personal and business needs for over 5 years. The girls do a great job, but an even better job when Val is on site. They will basically do anything that is asked of them. They are trustworthy and reliable too." 2018-04-23"
5★★★★★ - "Val has been cleaning my house for 14 years. Her cleaning crew is efficient and thorough. I have, and would recommend their services to anyone. They cleaned up after two renovations, the kitchen and the bathroom. Both clean ups were done swiftly and meticulously. Her crew helped clean the house, in preparation to selling it. And they continue to clean my new place." 5★★★★★ - "The best! Val and her team have been cleaning our house for about five years now, and we couldn’t be happier. Val has helped us prepare our old condo for sale, and scrub down our new home before we moved in. She cleans as if she owned the place - with meticulous attention to detail. Everything looks spotless and brand new after Val has visited - it’s a great feeling to return to our home after she and her crew hand cleaned. Not quite sure how she managed to get rid of some of the kitchen and bathroom residue. What’s more, is that we trust Val without reserve. She has her own set of keys to our home and is a true professional. We consider ourselves very fortunate to have developed a relationship with Val." 5★★★★★ - "Val and her staff have been cleaning my house for about 1 year. They have great attention to detail in their cleaning and organizing. I have been very happy with them and recommend them. Val is very pleasant to work with and amendable to changes in schedules." 5★★★★★ - "Val and her staff always do a tremendous job. They are professional, detailed, and flexible. We most recently worked with her during the sale of our home. She helped make sure our house was looking it’s best for our open houses. Highly recommend." 4★★★★☆ - "I always know that when I get home from work and Val's crew has been there. I had shoulder surgery and couldn't do the heavy cleaning. I greatly appreciate the time and care they take to clean my home." 5★★★★★ - "I might be one of Val’s oldest customers, she has been cleaning my house and office for 15 + years., Her employees are professional and courteous and no matter what the task, Val and her crew are there to tackle the chore. The smartest and easiest decision I made was to hire her. You should do the same"
5★★★★★ - "I’ve had Val as a cleaner for the past 16 years with no complaints. Val and her team are thorough and do a great job. She’s flexible with timing and days of the week and always lets me know if schedules change. I’d highly recommend Val and her team." 5★★★★★ - "The ladies are very professional and efficient. They arrive on time and they did a terrific job. We are very pleased with the people who continue to come to our home. I do recommend Val’s Cleaning to all my friends!" 5★★★★★ - "Best service ever received!! I don’t know what they do, it it might be magic or something like that but I don’t even sneeze from my dust allergy anymore!! Even though my dog doesn’t shed much, I can’t even find a single strand of dog hair. And the stove, spotless!! They can turn a old black stove white again(and not with paint). All of the experience makes it so they know all of the products that work on certain materials and which don’t. It is amazing what they can do. You must give them a call!!" 5★★★★★ - "She is the best in business"